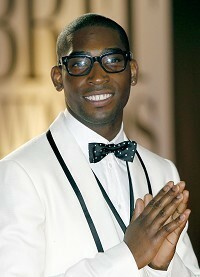 Tinie Tempah has vowed not to let his chart success and double Brits win go to his head. The Pass Out star, who scooped the gongs for British breakthrough act and British single, couldn't even get a seated ticket at the star-studded ceremony last year. "My biggest fear is losing touch with why I began doing music. I don't want to become blinded by the lights, so I keep the same people around me I started with," he told the Daily Mirror. "I never want to lose the connection with my family. They keep me grounded." Tinie plans to treat his relatives to a slap-up meal at his favourite Nigerian restaurant in South London to celebrate his awards haul. He added: "Last year I couldn't even get a seat at the Brits. I literally had to beg to get a ticket and stand."